The water flows from the Colorado down to the San Juan basin where our families live off of the life giving water for our crops and our live stock. On the Navajo Reservation, the leader of the community of Shiprock worries about corn, melons, squashes and other crops that could be lost if water from the San Juan River can't be drawn for irrigation. The New Mexico farmers stopped drawing water from the river following the August 5th wastewater spill at a mine in Colorado into a river system that carried the pollutants to the reservation. 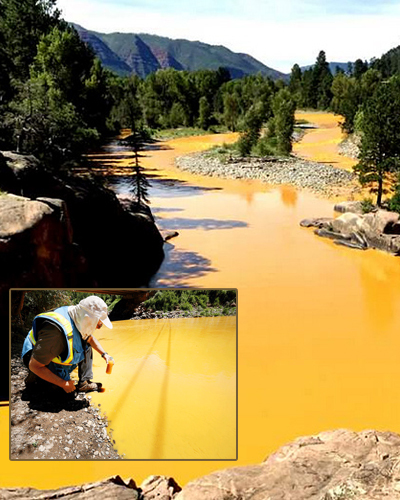 The 3 million gallons of toxic wastewater that spilled into the rivers, sadly will put the Navajo Nation most at risk. The impact is still being assessed, but given our reliance on agriculture and the river, it could be tremendous. Many good people have come together to bring drinking water to our northern brothers and sisters, but the long range consequences could be devastating because of contamination. Our lack of technology and usage of only the Navajo language, and our remote locations make it difficult to get the word out. We have cases of some of our people filling up water from the river for cattle and drinking. This disaster could also have a lasting injuries to our precious natural resources. Our people have a very keen identity with water and the spiritual realization and importance to our way of life. The traditional way is to morn the loss of pure life giving water. I do not wish to dramatize the situation. We have a hard life sometimes barely surviving here in the high desert. Then something like this happens, and it can be a temptation to despair. I have been encouraging all that I have met along the river to keep their spirits up, and not to lose hope. The disaster may have been an accident, but the millions of gallons of wastewater containing a variety of toxic substances such as mercury and lead left a yellow plume of toxic sludge that could have destructive and lasting affects we ,may live with for a long time. I don't have any more I can tell you at the moment, except that the Southwest Indian Foundation is a good and necessary charity that needs to be here and hands on when things like this happen. Emergency assistance is so critical in our remote and barren area. I was particularly worried about the children and babies that could be devastated by drinking water from the river. I felt like a watch dog keeping families away and shepherding them towards bottled water and safety. "Do not drink the river water!!" These are the times that we need you so much more. There are times of emergency where we have to be ready for rapid response and water, food, clothing, and shelter. We count on you, so the weak and unfortunate can count on us. We thank you for your past generosity, and pray you stay with us.